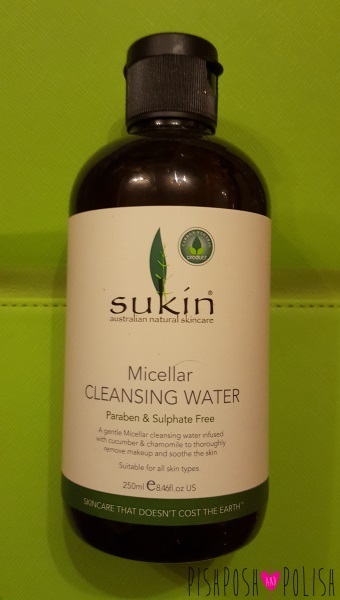 Micellar Cleansing water has taken over the beauty world by storm and honestly I can see why. A product that is super easy to use, feels like water, dissolves makeup and impurities and has so many options. There is surely a version to suit everyone! Although I admit there are maybe too many now with every brand releasesing a version. I myself must of tried at least six differet ones now (with varying levels of success). I have just seen that Boots has began selling Sukin, it is a brand that I really love and I am so glad that it is getting easier to purchase. Finally big retailers are listening and stocking natural 100% vegan, crurlty free alternatives to your favourite products. The cleansing water comes in this natural looking brown plastic bottle. It comes with a squeeze top lid so that you can gentle apply a small amount to a cotton pad without drenching and wasting all your product. I find that the smaller size bottle makes it much easier to control compared to some of the big-name bigger-bottle counterparts. My only complaint is that the colour of the bottles makes it hard to see how much product you have left unless you hold it up to the light. What drew me most to this product was the fact it was suitable for all skin types, Miceallar waters by design have tiny particles of oil in them that act as magnets trapping and removing dirt some but it means some micellar waters can be too oily or even too drying and my oily skin can be quite fussy. I have had some bad break outs in the past due to the amount of oil these cleansers can contain. However this water was gentle enough that it didn't irritate my skin at all, but at the same time doesn't strip the skin too much so is still hydrating. In fact this water is maybe the most gentle cleansing water I have used thanks to aloe vera and chamomile in the product. It also contains my arch-nemesis cucumber. Normally I detest this stuff but luckily (unlike the Soap and Glory Micellar Water who coincidentally since I posted my review have changed their packaging so a little picture of a cucumber is now on the front of the bottle ) you don't notice the scent at all. In fact I would go far as to say this is practically fragrence free! This product was really effective at removing my makeup. I think because it is so gentle I would still use a eye makeup remover to remove stubborn waterproof mascara as I needed to scrub a little too muuh for my liking to get it removed, but it easily dissolved my foundation and lipsticketc, leaving my face clean and fresh without any dryness or tightness to my skin. In all I would certainly recommend this cleansing water to anyone wanting to try it! I have only tried a couple of products from the range so I am excite to try more and see what Sukin has to offer! Cleaning of face is too much important and its helpful to make the smooth skin. So we can go to assignment writers uk for get the natural tips for cleansing of skin. Rose water is best and it provide the better result.